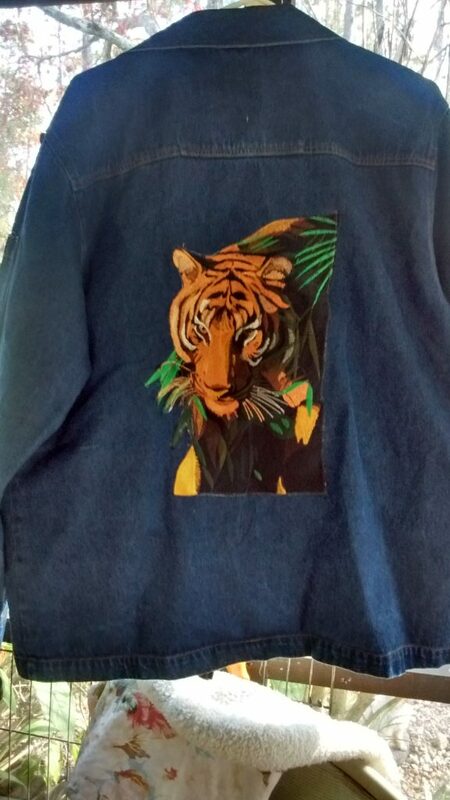 Marge stitched Fred’s Tiger, BFC1469 large Stalking Tiger, to the back of her jacket. I think he looks very impressive!!! Don’t you just love when you surprise yourself like this? I find myself getting into a sewing ‘rut’, afraid to try something different that’s either larger, or a different medium and though I’d be the only one who would know if I failed, I’m my absolute worse critic. The jacket is beautiful. Would you share what sort of machine you stitched it out on please, and any tips like stabilizer or anything else that would help us fraidy cats give it a go please? Tigers are one of my favorite animals – birds and penguins are right up there with them and I’d love to do a big fleece throw with Fred’s tigers and birds on them just for me to snuggle under while I read.